2015 Yamaha YZ85. Picture credits - Yamaha. Submit more pictures. Enhanced styling for a new front fender, front number plate, radiator shroud and side number plates. New coloring on the triple clamps and handlebars mimics the styling of the big YZs. Improved air intake efficiency as well as intake/exhaust port timing has been revised for improved performance. Price as new (MSRP): US$ 4090. Prices depend on country, taxes, accessories, etc. Ask questions Join the 15 Yamaha YZ85 discussion group or the general Yamaha discussion group. Bikez.com has a discussion group for every motorcycle. Here you may find answers to common questions about the model. If you do not find what you are looking for, you can ask questions. 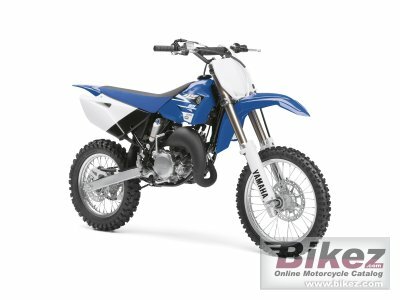 Try out the 2015 Yamaha YZ85 discussion forum. You can sign up for e-mail notifications when other users answer you. If you have information about any technical issue related to this motorcycle, please leave a comment for other riders.